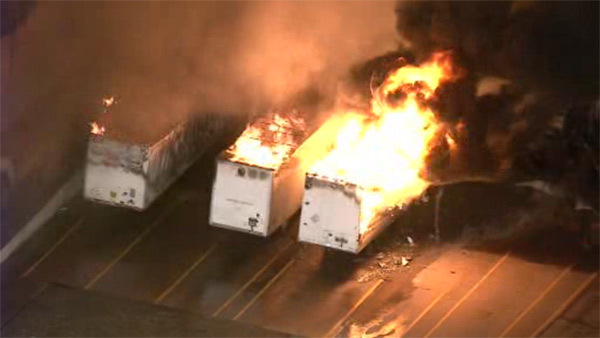 HAMMONTON, New Jersey -- A large warehouse in New Jersey continued to smolder hours after it caught fire. Flames shot from the Buffalo Farms Freezer and Cold Storage facility in Hammonton late Thursday night. It started before 9 p.m. Thursday on the 200 block of Pine Road. Atlantic County fire crews are on the scene of a multi-alarm blaze in Hammonton. The warehouse is reportedly 500 by 500 feet, and the fire spread to several tractor-trailers. So far, there are no reports of injuries.